Here’s your quick, fun, sometimes serious, and always interesting daily tech digest, by way of the DGiT Daily newsletter, for Monday, April 15, 2019! The six-engine aircraft has the world’s longest wingspan, at 385 ft (117 m), longer than a football field, and over 100 feet longer than any other plane. The six Pratt & Whitney jet turbines are mounted forward of the wing, with 28 wheels to guide it to a landing. The Stratolaunch is able to carry a 550,000 lb (250t) payload. The first flight reached a height of 15,000 ft (4,600m), at a speed of 165kn/189mph (305 km/h), for a 2 hour 29 min flight. Here it is landing (YouTube). 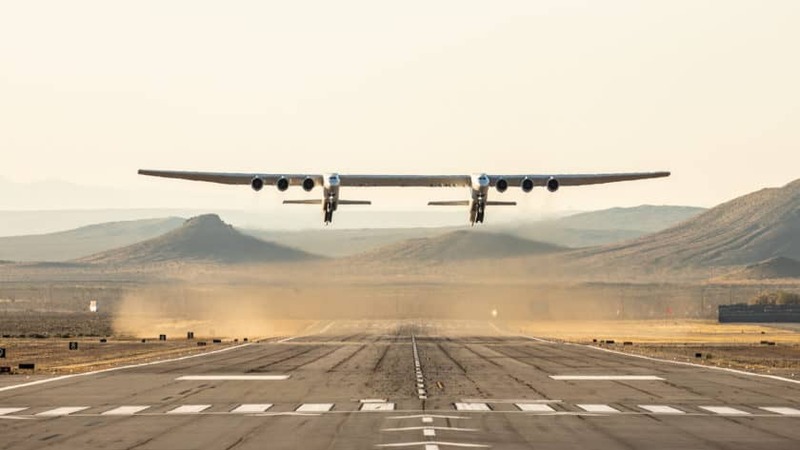 “All of you have been very patient and very tolerant over the years waiting for us to get this big bird off the ground, and we finally did it,” Stratolaunch CEO Jean Floyd told reporters. The Stratolaunch was designed to make launching satellites into low-earth orbits cheaper. The plane is designed to house as many as three rockets bearing satellites. The aircraft would climb to 35,000 feet, releasing rockets which would ignite and complete the final burn into orbit. Here’s a video rendering of that idea. But the with the untimely death of Paul G. Allen, the ambitious effort had been scaled back, with commercial customers for the aircraft few and far between. The flight marked an important success for the venture, but its future is not entirely clear. Stratolaunch hasn’t made clear when additional flights will happen, or when certification from the Federal Aviation Administration may happen to carry rockets and satellites into space. It may be the second coming of the Spruce Goose, a one-flight wonder. Does it matter, though? Opinion is split that it’s a gigantic waste of time, or a brilliant concept to offer new and potentially low-cost passages into space. I’m too much of an optimist to think anything but the latter, but regardless, it’s exciting to see the plane work. 2. OnePlus 7 “series” tipped to launch globally on May 14 (Android Authority). 3. Apple is spending “hundreds of millions” on its upcoming Arcade video game service, with indications this is going to drive more sales over the more star-studded TV+ offer (FT). This will restrict a host of games to iOS, and leave Android devices with fewer options. 4. Why the Google Pixel 3a could be a game-changer (AA). 6. “5G networks will change our lives for good — But at what cost?” – from me (AA). 7. On that note: “One month, 500,000 face scans: How China is using AI to profile a minority” (NY Times). AI ethics be damned. 8. “I’m going to ditch Netflix for Disney Plus – here’s why” (DGiT). 9. Leaks suggest a disc-free Xbox is coming as soon as tomorrow, at Microsoft’s Inside Xbox launch (Xbox). 10. Tesla said on Thursday night that the cheapest $35,000 version of its Model 3 would no longer be offered online. The Times tried to buy it offline, and learned a few things (NY Times). 11. ‘Baby Shark’ mixed into ‘Sandstorm’ at Coachella is really quite something (Mashable). 12. In Sweden, people are feeling guilt for flying – known as ‘flying shame’ – and airline passenger numbers are dropping, as Swedes catch more trains (Bloomberg). 13. Mutiny at HQ Trivia: attempt to oust CEO failed, core mutineers fired, and popular host Scott Rogowsky has now left for DAZN (TechCrunch). Finally, a tech subscription worth reading. Sign up for daily digests of the tech content most relevant to you.